Swimwear (Swimsuit) Market Segmentation by Product Type - Athletic, Non-Athletic; Fabric Type - Nylon, Polyester, Other Synthetics (Neoprene, Cotton, Polybutylene Terephthalate etc. ); End user - Men, Women, Kids; Distribution Channel - Online, Offline (Supermarkets and Hypermarkets, Specialized Stores, Single Brand Stores, Multi Brand Stores etc. Swimwear is clothing used by individuals during swimming and for various other sports activities such as water sports, water skiing, surfing, and sunbathing. It is apparel used during water based sports events and is also used during body building contests, beauty pageants, and in glamour photography and magazines such as annual Sports Illustrated Swimsuit Issue featuring models and sports personalities in swimsuits.Wide range of styles of swimwear and swimsuits are available globally according to body coverage and materials. Choice and style of swimwear depends on user application, personal preference, and current fashion trends etc. The global swimwear market has been segmented based on product type, fabric type, end-user, distribution channel, and region. In terms of product type, the non-athletic segment acquired the largest market share of approximately 65% in 2017 due to its widespread application across the globe. Non-athletic swimwear includes all swimwear apparel that are used for casual swimming and not for competitive purpose. Geographically, the swimwear market is segmented into North America, Europe, Asia Pacific, Middle East &Africa (MEA), and South America.Europe held the majority value share of approximately 31% in the global swimwear market in 2017. Rising awareness about health benefits of swimming is boosting the swimwear market across the globe. Additionally, increase trend of family vacations along beaches, resorts, and theme parks is making swimwear popular, which in turn is boosting the swimwear market. Asia Pacific region is anticipated to witness the highest growth at a CAGR of 6.9% during the forecast period. The region had highest volume share of approximately 35% in 2017. Asian countries such as China, Bangladesh, India, and many other Southeast Asian countries are the largest producers of nylon, polyester, and many other textiles in the world. China alone contributes 60% of global polyester fiber production output. Additionally, rise in Asian tourism is anticipated to boost the swimwear market. More foreigners are arriving in Asian countries for tourism which is proliferating the growth of the swimwear market. Moreover, Asian countries being cheaper for travelling is helping in boosting the percentage increase of foreign tourist arrivals. This in turn is helping to increase the popularity of swimwear in Asian countries. Based on fabric type, the nylon segment acquired highest share of approximately 62% in 2017 and the segment is expected to expand fastest during the forecast period at a CAGR of 6.4%. In terms of end-user, women’s segment acquired majority of the share and is further anticipated to expand at the highest rate during the forecast period at a CAGR of 6.4%. According to distribution channel, offline segment held major market share of approximately 85% globally. Swimwear is a need based apparel and is majorly preferred to be purchased offline due to its easy availability. People prefer to try and test prior to purchasing swimwear, which is why the offline purchase mode is more popular. However, lack of time, increased awareness among individuals, wide product availability etc. is anticipated to increase the sale of swimwear through the online mode. 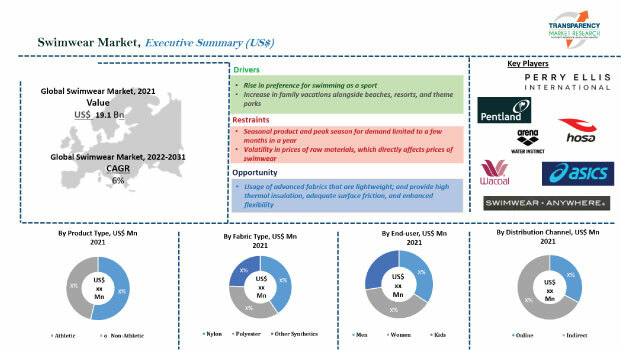 Volatility of raw material prices is a major challenge impacting the growth of the global swimwear market. Prices of raw materials of swimwear such as nylon, polyester, spandex, polypropylene etc. keep on changing, based on various external factors such as change in oil prices, economic instability of a country, trade wars etc. Such fluctuation in raw material prices ultimately impacts the price of the final product. Additionally, significant research and development has to be done by manufacturers to meet the seasonal demand. Investment in machineries becomes important to manufacture swimwear during peak seasons to meet the seasonal demand. This becomes difficult for many manufacturers due to lack of suitable finance options for investment in machineries and ultimately impacts the demand and supply of swimwear apparel and eventually the swimwear industry. However, new product innovations are expected to create new opportunities in the swimwear market.Usage of advanced fabrics which are lightweight and provide high thermal insulation, adequate surface friction, and enhanced flexibility is anticipated to create new opportunities in the market.